Orchids are classified by how they live in their natural environment. Mimicking their environment will help in the tropical flowers life expectancy. You can find healthy orchids growing on rocks, in the ground and mounted high above in the trees. The three different ways have specific names that you may hear: epiphytes, terrestrials and lithophytes. Find out how your tropical flower grows! Epiphytes have evolved throughout the years to live on trees. These growing orchids do not harm the tree in any way, unlike parasite plants that take the trees nutrients. They simply use the tree for support. Its really neat to see how over time the roots begin to branch throughout the trees crevices. 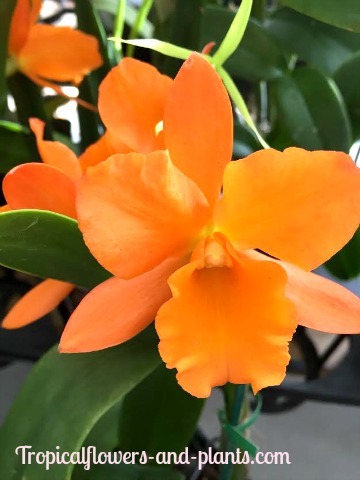 Mounting Epiphytes to any of your trees gives your landscaping not only a tropical look but it also looks amazing when the orchid is in bloom. Epiphytes use every part of the tree to help them with their survival. They gather nutrients from the moisture in the air and from debris that has accumulated within the trees branches. Majority of the orchid species will cling to the main trunk or a large branch that is close to the trunk. You will notice that certain species will only grow on one side of the tree to keep from excessive amounts of wind. Epiphytes are very picky in the tree they choose which may be due to the texture of the bark. The coolest part is….. When the main tree losses its leaves so does the orchid. The orchid acts like it’s one with the tree. Terrestrials are also known as your ground orchids. Ground orchids have adapted to grow in the most diverse places from dry deserts to grasslands. Terrestrials may be found growing as single tropical plants to small colonies. When looking for terrestrials in the wild you will notice that they come up sporadically and different seasons will bring different species to look at. Unfortunately with the amount of building on lands, farming and chemicals being used is causing terrestrial orchids to be a rare find within nature. * During winter some may die back but will arise during the growing season. * Since their roots grow in the ground they receive their nutrients from the soil. I have 2 different types of ground orchids in this picture. The ones that are blooming are Spathoglottis and the ones to the right of my Buddha are Reeds. 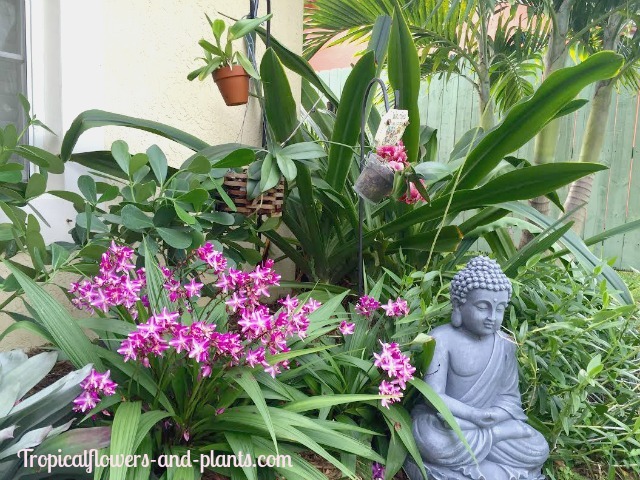 Both ground orchids are very easy to maintain and are always blooming. Lithophytes are pretty amazing orchids that can be found growing in the toughest environments. These orchids are located somewhere in between the epiphytes and the terrestrials. Lithophytes simply means "upon on a rock" so that is where you will find these beauties. Not only do they grow in harsh places but they also have to withstand the climates. Lithophyte orchids are able to survive these harsh locations by rainfall and roots that branch out to collect nutrients from under rocks or mossy coverings. Not all settings are the same so depending on the environment is how much of each nutrients they collect.